When there is a little wind on the lake or the bass just aren't reacting to a standard walking frog the Bronzeye Popper can really shine. 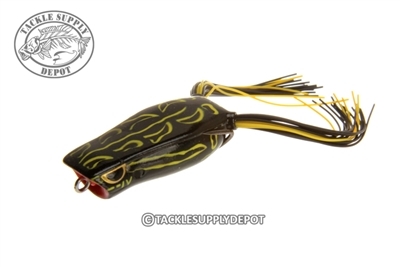 Taking elements of the original Bronzeye and adding the cupped mouth for extra attraction the Bronzeye Popper Frog has become a huge success ever since its release. Cast it into pockets and cover where other baits cannot venture, or weeds and pads or around docks where bass are lurking. The Bronzeye Popper Frog casts like a bullet and is weighted to land upright every time. Walk it, Pop it or Chug it; the Bronzeye Popper Frog is the perfect counterpart to the original Bronzeye Frog for that One Two knock out. The Bronzeye Popper comes with specially designed Gamakatsu Double Frog Hooks that fit the bait perfectly for solid hook ups and is available in a wide array of proven fish catching colors.